Do you want your bathroom to have an unexpected look? If so, you may consider one of the hot new trends for bathroom design: going asymmetrical. Instead of balancing out the layout and fixtures of the room, concentrating them unevenly will make the space eye-catching. TLC Home notes that asymmetry in a bathroom creates a look of sophistication that usually is incorporated in Asian and modern design. 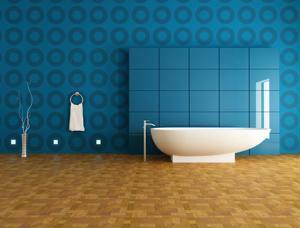 So if you are looking to give your bathroom a fresh, new age appearance, this style may work well. If you're installing a bathroom from scratch, you have the advantage of putting the furniture and fixtures anywhere you would like. To create an unbalanced look, try concentrating these pieces together on one wall, leaving the rest of the space open. Houzz showcases a few bathrooms that implement this design technique. One of these rooms has a bathroom vanity directly next to the toilet. The shower is on the same side of the room as well. Additionally, all along this wall, hanging from the ceiling are many elaborate pendant lights. In this way, one half of the lavatory is crowded, while the rest of the space is free. The bathroom vanity is often the focal point of the room. You can use this fixture to emphasize the asymmetrical element of the space. Instead of putting a basin sink in the center of its surface, you may consider putting it over the far left or right of the piece. Use the colors of the vanity to disrupt the balance. If the surface of the vanity is black, why not install a white sink on it? If you put a large mirror over this sink, you can further emphasize one side of the vanity, leaving the other half of it open. Instead of evenly interspersing accents around your bathroom, you might group these decorations in one area to set things off balance. Leaving the rest of the wall space blank, put any decorative pieces, such as a large vase or a painting, in one area. Again, you can use color to create further contrast in the space. Perhaps paint the room white, or another light hue, and find black or darker colored items to decorate the area. By doing so, you will create a feeling of imbalance that will make your bathroom aesthetically pleasing and distinct.